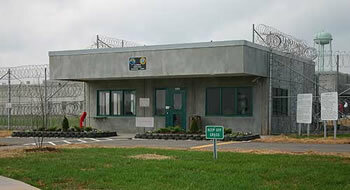 Alexander Correctional Institution is a single-cell, close-custody prison facility located in Taylorsville. The prison employs correctional officers, registered nurses, nurse extenders, mental health providers, dental, maintenance and administrative staff. The prison has 128 segregation cells, eight medical infirmary beds and a 252-bed minimum-security unit. The prison operates under the management concept. Unit management is a method for managing inmates that emphasizes decentralization and delegates decision-making authority to a unit team. Inmates are assigned to one of the four units based on their work, program or control assignment. Blue Unit houses inmates with chronic health issues, new admissions into the institution, inmates being released from segregation or control status, and inmates assigned to unit-specific jobs. Green Unit houses inmates assigned to the Correctional Enterprise furniture plant, institutional job and program assignments. Red Unit houses inmates assigned to the residential mental health program, specific and segregation janitorial jobs, and outpatient mental health status. The segregation unit houses inmates assigned to administrative and disciplinary segregation, as well as those on intensive and maximum control. In 2007, a Correction Enterprise plant that produces wood products items and upholstered furniture began operation in the vocational space within the prison. Staff from Catawba Valley Community College conducts an instruction program that works with CE staff to train inmates in the manufacturing process. Instructors from CVCC also provide instruction for the inmate population for basic education, GED prep, computer application, commercial cleaning and horticulture technology. Visitation is by appointment only. Attorney, non-contact, infirmary, clergy and media visits will occur Monday – Thursday (8:30 a.m.- 10:30 a.m., 1 – 3 p.m.). Monday – Thursday visits must be scheduled at least 24 hours in advance of the proposed visit and no more than 7 days from the visit. Non-contact visits will last for 1 hour. Attorney/media representatives must fax a letter on their appropriate letterhead stating the inmate that he/she would like to visit and the requested date and time of the visit. When approval is granted, the attorney/media representative will be notified of the time and the approximate duration of the visit. Friday and Saturday visits will be contact visits for inmates housed on the Blue, Green and Red units, and will be consistent with the rotating schedule already in place. Approved visitors must contact the Visitation Appointment Officer by 5 p.m. (Wednesday) each week to schedule a Friday visit, and by 5 p.m. (Thursday) to schedule a Saturday visit. Visitors may only schedule a Friday or Saturday visit during the week of the proposed visit. To schedule a visit, you may contact the Visitation Appointment Officer at (828) 632-1379. If the person is not in, you may leave a message on the answering machine with your name, name of the inmate and OPUS Number of the inmate which you are requesting to visit, the day/time of the requested visit and the telephone number you can be reached at. The Visitation Appointment Officer will inform you if the visit has been approved. A valid photo identification card must be presented by anyone 16 years or older arriving at the institution to visit with an inmate. Alexander CI is located on Old Landfill Road off of Macedonia Church Road in Taylorsville. From Interstate 40 in Statesville, take the Taylorsville Exit. At the stop sign, take a right onto US 64 West. Go approximately 17 miles to Taylorsville. Once in Taylorsville, take a right on to the exit before the bridge and proceed up the ramp. Take a left at the stoplight (NC 16 South). Go approximately one mile and turn left onto Macedonia Church Road. Take the next right onto Old Landfill Road. Go approximately one-half mile and the prison will be located on the right.